Rufus Marigold Book Launch and Exhibition! 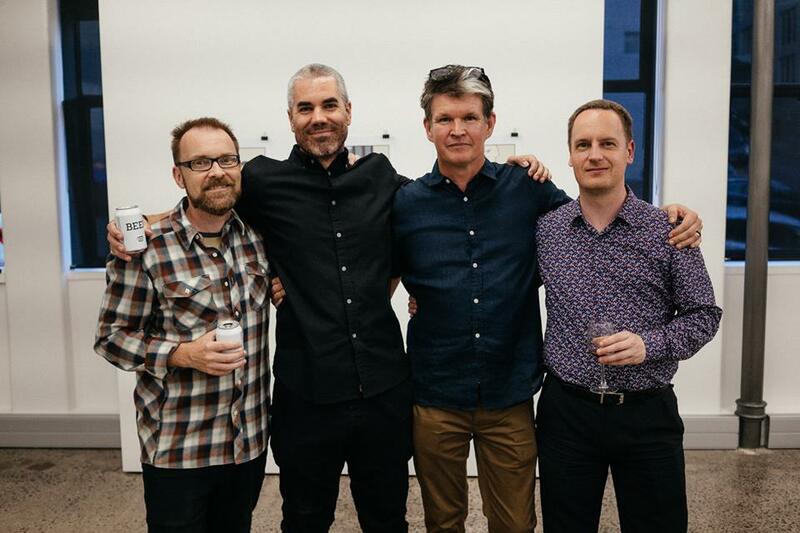 Above: Author and Artist Ross Murray at The Tuesday Club Art Gallery. 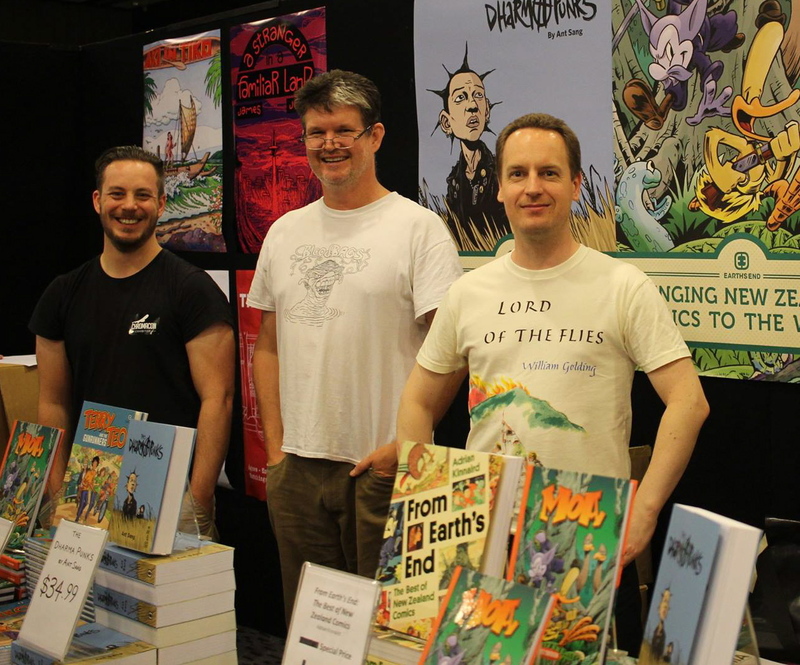 Above: Author with the Earth's End Publishing team (from left): Damon Keen, Ross Murray, Kelly Sheehan and Adrian Kinnaird. All photography copyright Chris Leskovsek 2019. 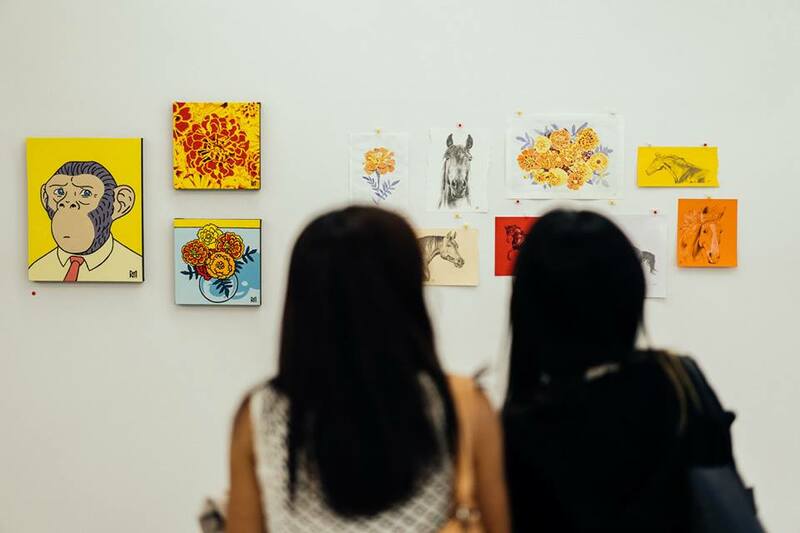 EVENT: Rufus Marigold Book Launch and Art Exhibition! 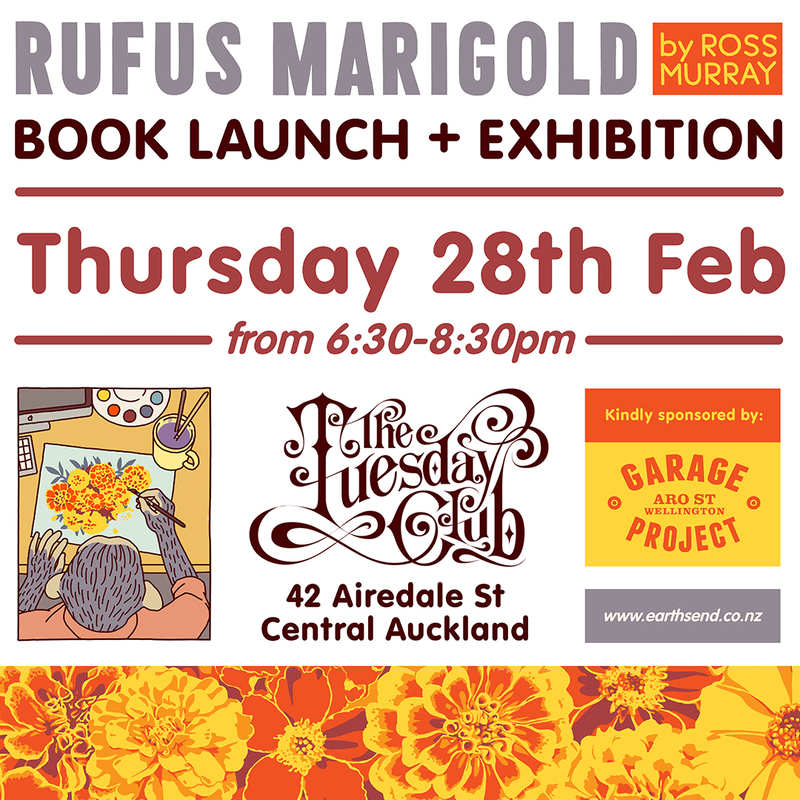 Join Earth's End Publishing for the launch of our latest graphic novel, Rufus Marigold by Ross Murray. 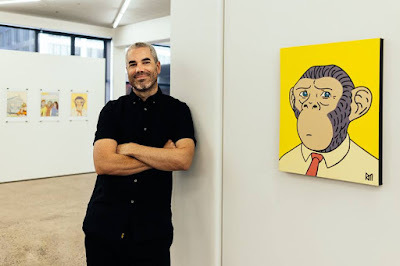 The launch will be held at The Tuesday Club, 42 Airedale Street in Auckland Central, along with an exhibition of original art by Ross Murray, featuring his eponymous character and an exploration of related themes from his book. Kindly sponsored by Garage Project with refreshments provided. 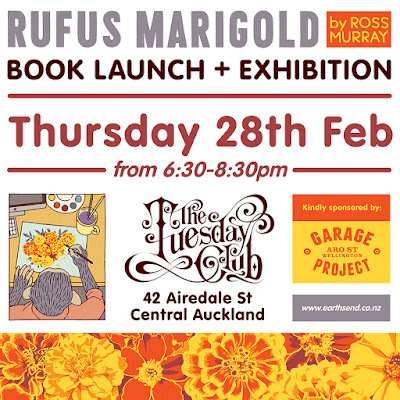 Copies of Rufus Marigold will be available for sale on the night courtesy of Unity Books Auckland. 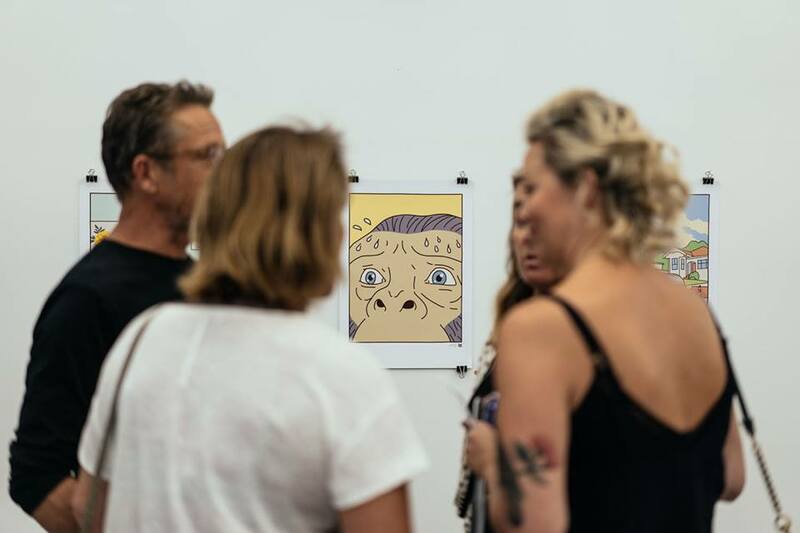 The Rufus Marigold Art Exhibition will continue after the book launch at The Tuesday Club from Friday 1st of March to Sunday 3rd of March. You can RSVP at our Facebook event HERE. So come pick up a copy of the book, meet the author, and view some amazing artwork! Above: The cover of Rufus Marigold by Ross Murray. 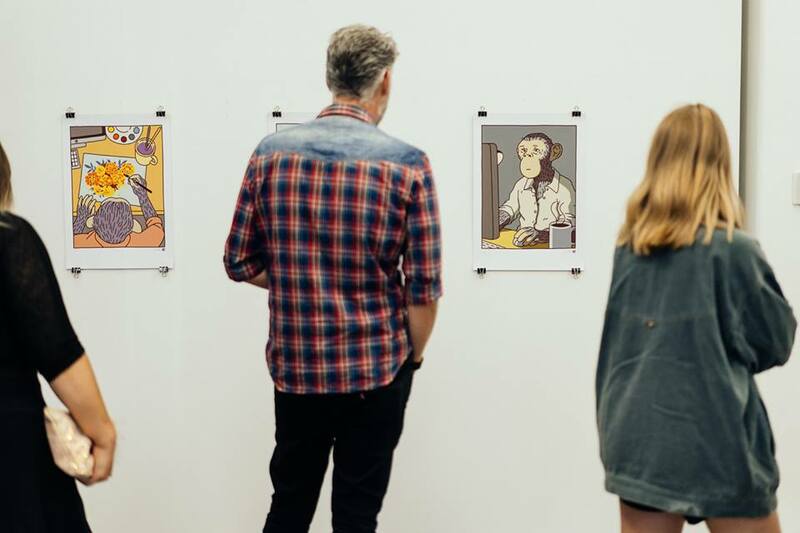 Copyright Ross Murray 2019. 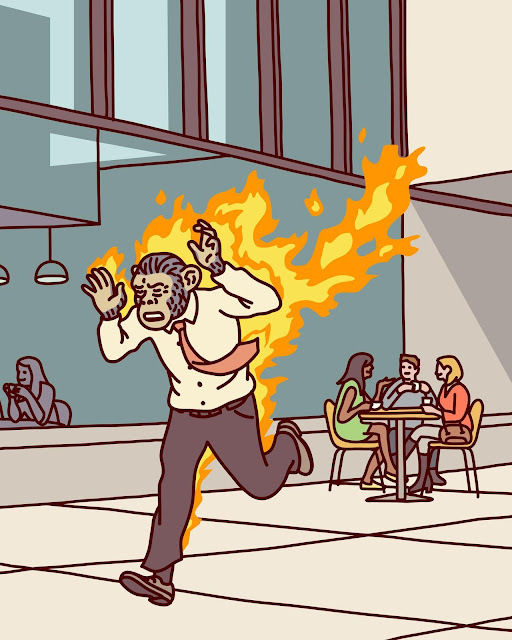 Earth’s End Publishing is proud to announce our latest publishing endeavor - a collection of Ross Murray’s acclaimed webcomic, Rufus Marigold. 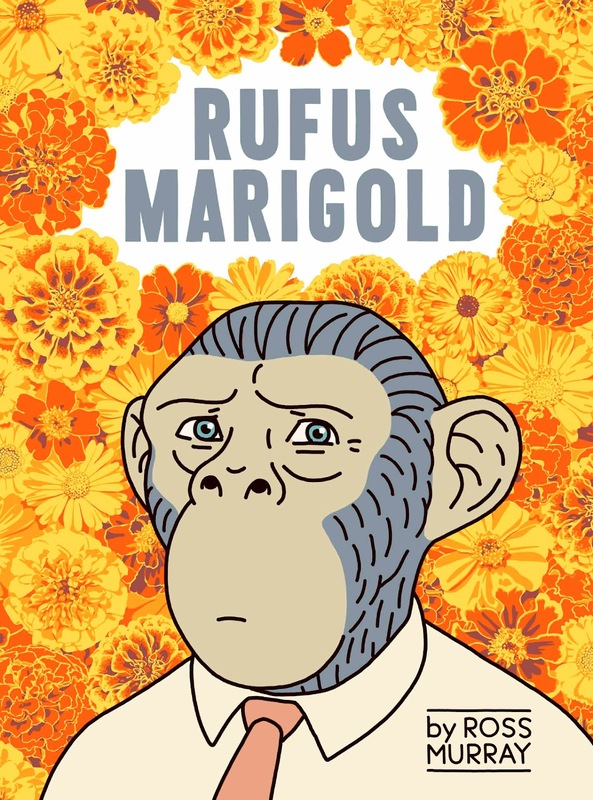 Initially released online in 2016, Rufus Marigold explores social anxiety disorder through the prism of its eponymous character and drew a devoted audience and praise for it’s equally humourous and at times heartbreaking insight into this much maligned subject. 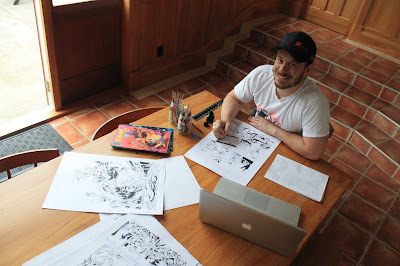 After seeing the initial webcomic online, Earth’s End was quick to reach out to creator Ross Murray and work alongside him to develop this series into a unique and beautiful graphic novel. 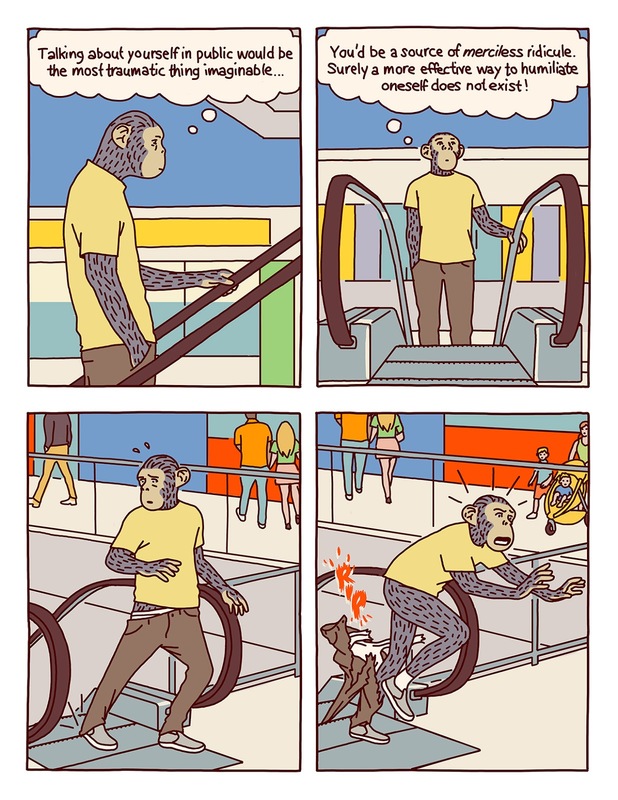 The print version of Rufus Marigold will collect all the original material and adds brand new additional vignettes, furthering and deepening the story of man-monkey Rufus and his attempts to define himself as something other than a complete and utter nervous wreck. 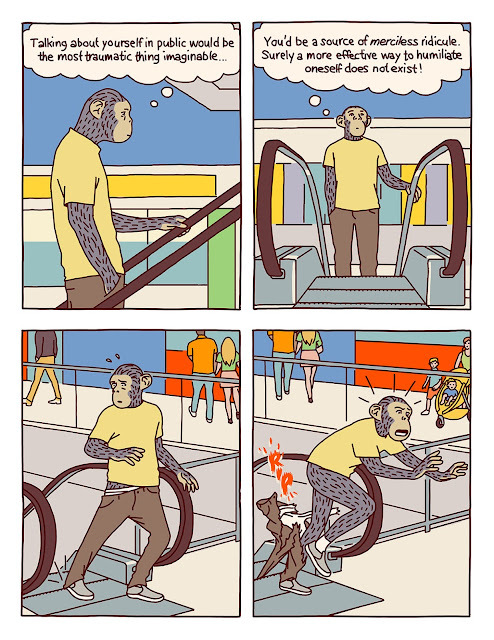 Above: Artwork from Rufus Marigold by Ross Murray. 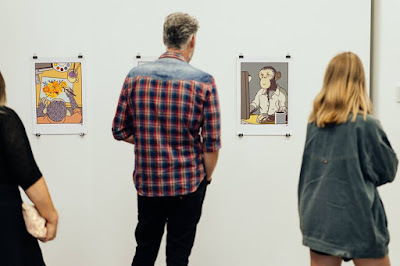 Copyright Ross Murray 2019. Ross Murray is known for his sharp art and vintage style illustrations. Recently his work has graced the covers and interiors of the Lonely Planet Epic series. 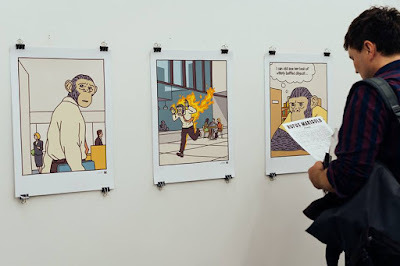 In additional to his commercial work, Murray has also been making comics since 2014 when his Pets Talk Records strip appeared online. 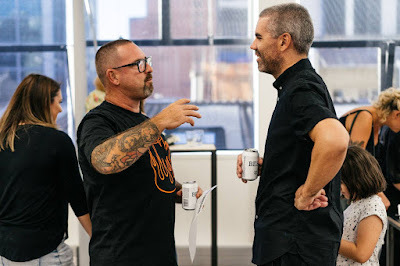 In 2015 Murray contributed to the Faction High Water anthology, edited and produced by Earth’s End co-founder Damon Keen. 2018 saw his humourous takes on Star Wars and Home & Away featured on the Vice website comics section. 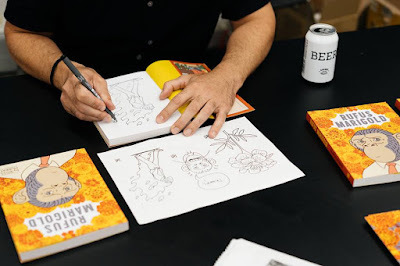 Rufus Marigold is Murray’s first full length graphic novel. Rufus Marigold by Ross Murray will be released March 1st, 2019 in bookstores and comic shops across New Zealand. Copies will also be available to pre-order directly from our website store. Rufus Marigold is now available for pre-order from Earth’s End Publishing. Please do not hesitate to contact us if you have any queries or require further information. EVENT: Bookrapt Seminar: Zap! Pow! Flash! This weekend, Moa author James Davidson is speaking at Bookrapt's annual seminar for 2018 on Saturday, July 28th at the Tauranga Girls' College Library from 8:45am to 12noon. Bookrapt is a group of writers, artists, schoolteachers, librarians, parents and grandparents with a passion for children's literature. Their speakers this year are James Davidson and Angie Belcher who you can enjoy along with a morning tea, raffles, book signings and a stall by local booksellers and experts in children's literature, Books A Plenty. A cartoonist at heart, and an art teacher and deputy principal by day, James Davidson's love of comics started as a kid. 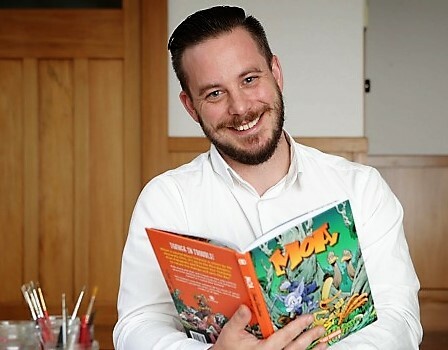 When he is not working with young people, James is the creator behind the comic book Moa, which he draws and colours. From the world of teaching and writing children’s books, to the recent writing and production of her first play, Angie Belcher has become focused on bringing books alive through role-play, readers theatre, and a chorus of voices. Her presentation at “Zap! Pow! Flash!” will focus on sharing these concepts, arming you with “super powers” for motivating readers. General admission is $50, members tickets are $35. For more information and tickets, visit the event page HERE. James Davidson to appear on What Now! We're excited to announce James Davidson will be appearing on children's TV show, What Now on TVNZ2 this weekend from 8am! He'll be talking about creating MOA and all things comics related, so make sure you tune in! Above: James Davidson. Photo credit: Grant Matthew/Fairfax NZ. 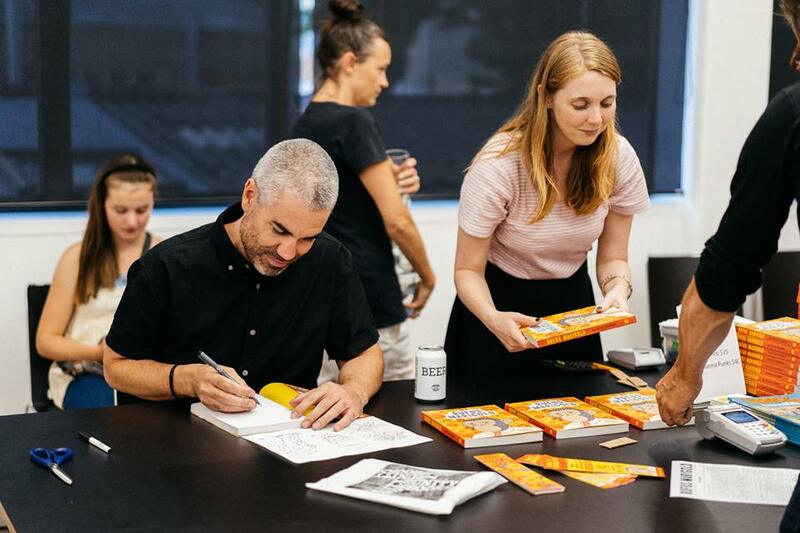 In this weekend's Sunday Star Times, James Davidson spoke with Arthur Whelan about the origins and years of hard work that went into creating his children's comic series Moa. You can read the full interview at the Stuff website HERE. Earth's End at Chromacon 2017 Report! Above: Earth's End Publishing at Chromacon: from left: James Davidson, Kelly Sheehan and Adrian Kinnaird. Photo by Ant Sang. The Earth's End Publishing team were proud to launch James Davidson's Moa at the recent Chromacon Indie Arts Festival held earlier this month at the Aotea Centre in Auckland. Our authors were in attendance, with James Davidson signing copies of Moa and sketching up a storm - including a portrait of Chopstick, the hero of Ant Sang's The Dharma Punks - and Ant Sang signing, sketching and acting as team photographer! 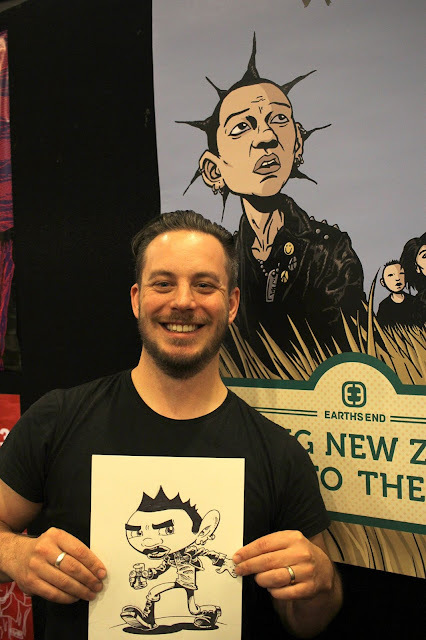 Above: James Davidson poses with his sketch of Chopstick from The Dharma Punks. Photo by Ant Sang. 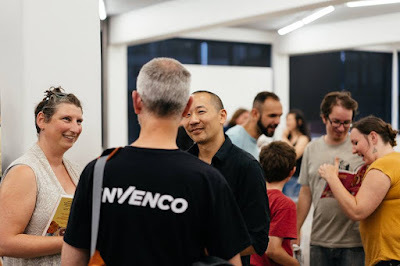 It was great to see catch-up with so many great artists profiled at the event, and of coarse the art fans who make events like this so successful. 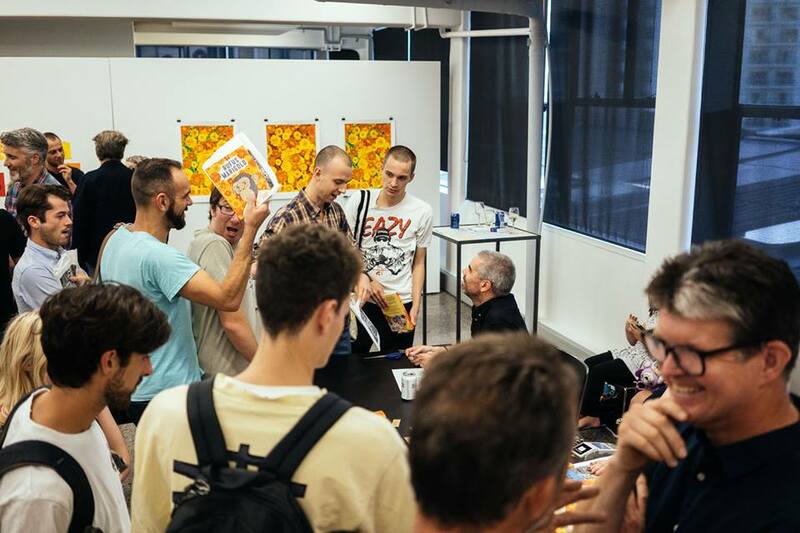 A big thanks to everyone who came out and purchased a copy! Moa is now available from leading bookstores, and from our website HERE. 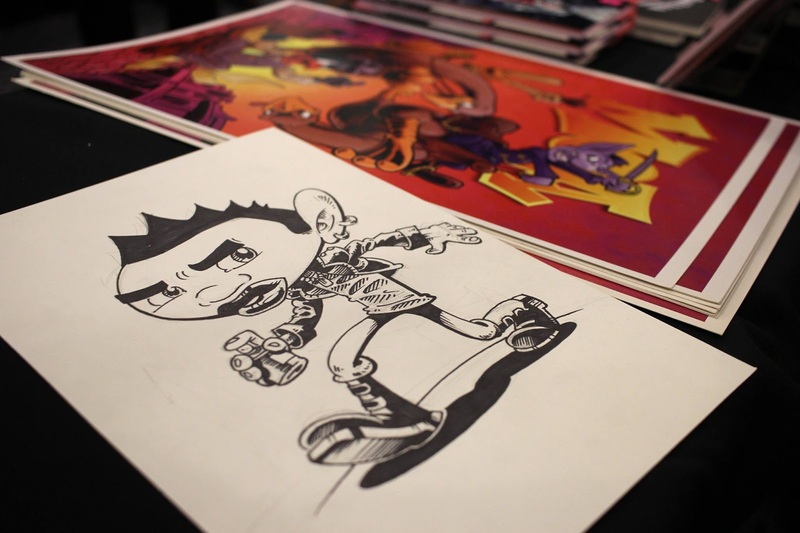 Above: A close-up of James Davidson's sketch of Chopstick from The Dharma Punks. Photo by Ant Sang.